I cannot wait to show you Stampin' Up! 's NEW Holiday Catalogue - products will be available for purchase on the 1st of September 2016! I have to tell you Stampin'Up! is going bigger and bigger with their seasonal catalogues! Today I'm sneaking you a peek at one of the products... the Cookie-Cutter Christmas Photopolymer stamp set and its coordinating punch the Cookie Cutter Builder Punch! Álso a peek at the Candy Cane Lane Designer Series Paper! 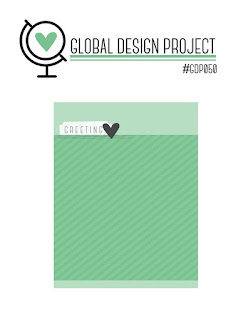 This will also be my entry for this week's Global Design Project Challenge. A sketch challenge! Yay!! I don't know about you but I don't want to spend too much time creating only one Christmas card! I want to create many! Friends and family, class mates, etc all add up to a whole lot of cards! I prefer quick cards for Christmas and I have to say the NEW Holiday Catalogue will make it so easy to create beautiful, quick cards! Lots of room to play with this one! I shiny nose for Rudolf thanks to the Fine-Tip Glue Pen. I stamped the Reindeer image with Soft Suede ink and used both Soft Suede and Crumb Cake ink to colour with an Aqua Painter. I used a Real Red Stampin' Write marker for the nose! If you live in Western Australia and would like me to send a Holiday Catalogue to you (it's FREE) leave your details! Let me know what you think! I love reading your comments! Won't mind at all Denita! Thanks! I fall more in love with the Cookie Cutter bundle, especially when I see goodness like this! 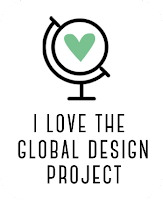 Thanks for playing at Global Design Project wit us this week. Thanks Tracey! This bundle and a quite a few others from the Holiday Catalogue will help you make quick cards that you can be proud of! Thanks Angela! I hope to go but this will all depend on where my hubby will be - he works away! Fingers crossed! This is such a cute card! You stamps and papers go perfectly with this challenge and I love the watercolor effect on the reindeer!